Indianapolis, often affectionately referred to as Indy, is known for fast cars and professional sports teams, the city is the largest and capital city of Indiana. 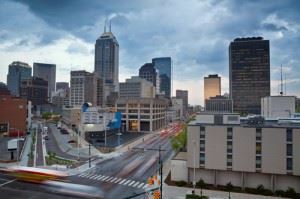 Founded in 1821, Indianapolis is in the heart of the Midwest and is the 16th largest city by land in the United States. The city is home to the Indianapolis Motor Speedway which draws hundreds of thousands of people every year for racing events as well as its famed Indianapolis 500. Racing isn’t the only sport that draws attention to this lively city, the city is also home to the Super Bowl Champions, the Indiana Colts. The city is home to so many attractions, including the Indianapolis Children’s Museum which is the largest children’s museum in the country. According to city-data.com, “Indianapolis is a primary industrial, commercial, and transportation center for the Midwest.” Indianapolis is a major hub of transportation thanks in part to its location and ability to quickly reach almost any state in the country. Major sporting events also bring in millions of dollars each year, while tourism, healthcare and conventions are other major economic contributors. According to point2homes.com, just over twenty five percent of the Indianapolis population holds a Bachelor’s Degree and lists the average household income as $65,874. Occupational employment is almost split down the middle with nearly sixty percent of the population working white collar jobs and right at forty percent working in blue collar positions. The city of Indianapolis is working to find its way to a greener tomorrow through improving its recycling programs and sustainability efforts. The city offers curbside recycling for a small fee and also offers drop-off locations that will take certain items. The city of Indianapolis is working to improving its rate of sustainability and recycling. The city has developed ways to encourage sustainability by offering its SustainIndy Community Grant to help those with ideas for improvement with a $10,000 starter grant. · The city of Indianapolis offers twenty-six drop-off locations for residents to bring trash and recyclables. Junk King Indianapolis is a perfect fit for sustainability be it through commercial or residential cleanouts. Junk King can help the city of Indianapolis and its residents take that leap into a greener and cleaner way of life. With your rental of a Junk King roll away dumpster, all of your unwanted items are taken to a recycling warehouse where employees take the time to sort each and every dumpster rental collection for metals, e-waste, paper, household goods, textiles, furniture and appliances before simply tossing more trash into the landfills. “Going green” is more than just recycling. Some of the other ways Junk King contributes to a more sustainable future is its ability to donate, repurpose, and reuse everything from clothing, toys, baby cribs and strollers to office furniture and supplies. Many of the Junk King trucks run on biodiesel, a domestically produced fuel made from more environmentally safe non-petroleum, renewable resources. Junk King is committed to continuing to lead the way to help keep the planet clean, green and beautiful for the generations to come. The city of Indianapolis seems to be searching for ways to be greener and increase its sustainability and Junk King is the perfect partner for its residents and businesses. If you are looking for the most convenient way to remove trash, junk and debris from your home or office, the Junk King MINI Dumpster is the perfect solution. If you are remodeling, moving or just doing a big clean-out, Junk King Indianapolis provides quick and easy access to free quotes by phone or an online estimator and fast, affordable service. Simply choose a date and time to schedule your dumpster rental and contact Junk King for a quick estimate and your junk will be rolled away. With the Junk King MINI Dumpster, you are given three days to fill it on your own timetable before it is hauled away. The MINI Dumpster an easy, fast, purposeful way to remove your junk and debris. Sustainability, green-living and recycling are all top priority for Junk King. As a company, Junk King Indianapolis is committed to a greener way of life and the MINI Dumpsters are just the start! 1) How do I know what size dumpster I need? a. With the Junk King MINI, a 12-cubic yard, driveway friendly debris box is delivered right to your place of business or your home. Most household remodels and clean outs can be complete with a Junk King MINI. 2) What will Junk King Indianapolis take? a. Furniture, appliances, textiles, construction debris, yard debris and more. If it isn’t hazardous, Junk King will haul it away. a. With fair, flexible pricing for its customers, Junk King is set apart in dumpster rentals as you only pay for the space you use. 4) When will you pick up the Junk King MINI Dumpster? a. Junk King offers MINI Dumpsters for drop-off for three days offering you the flexibility to fill it on your own time table. If you are green-minded or just concerned about getting your junk removed, Junk King Indianapolis is here to help! Junk King Indianapolis takes great pride in the reviews we receive and serve as a daily reminder that our community is worth the efforts of recycling and green-living. We strive to help improve the lives our customers and our reviews help us improve daily. July 24, 2017 by L.S. July 22, 2017 by J.F. July 16, 2017 by S.G.
Is recycling, reuse and waste reduction important to you? Junk King Indianapolis is committed to increasing sustainability wherever we can. The top-rated customer service offered by Junk King is something we pride ourselves on. Please consider using Junk King for your dumpster rental and junk removal. Call today (317) 427-5155 or visit Junk King online to get a quick and easy quote for dumpster rentals or for more information on what size dumpster would best suit your needs. This entry was posted in Uncategorized and tagged Junk King, junk King Indianapolis, junk removal on August 29, 2017 by Julian Torres, "JT". Last updated January 19, 2018 .